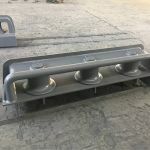 Warping roller,also known as marine roller,fairlead roller.We can supply various sizes roller according to JIS, DIN and GB standards,we can also make these products according to buyer's drawings. 1.can be made by cast iron,cast steel or as requested. 4.Certificate:CCS , BV, ABS , mill certificate etc.